There is something undeniably satisfying about using a bow string that you have made with your own hands. Yet most new archers don’t know how to make a bow string. 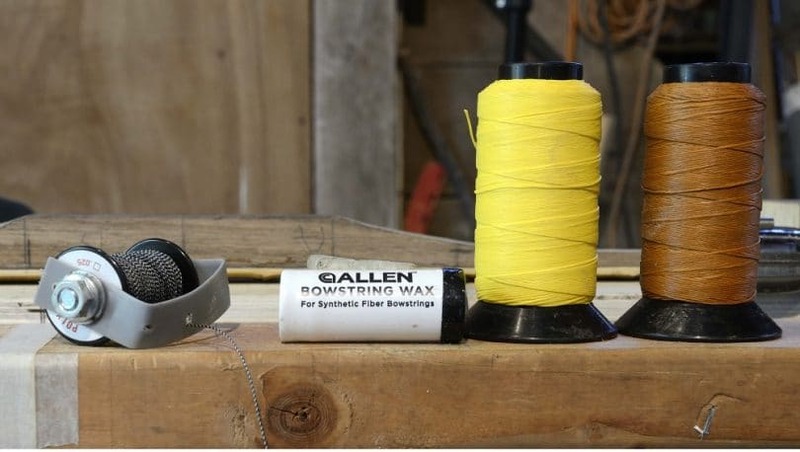 And although there is a lot of debate out there, it’s not often clear what the best methods are for making a bow string at home. At the end of the day, making a bow string is not that challenging, but be prepared to make a few mistakes the first time through. 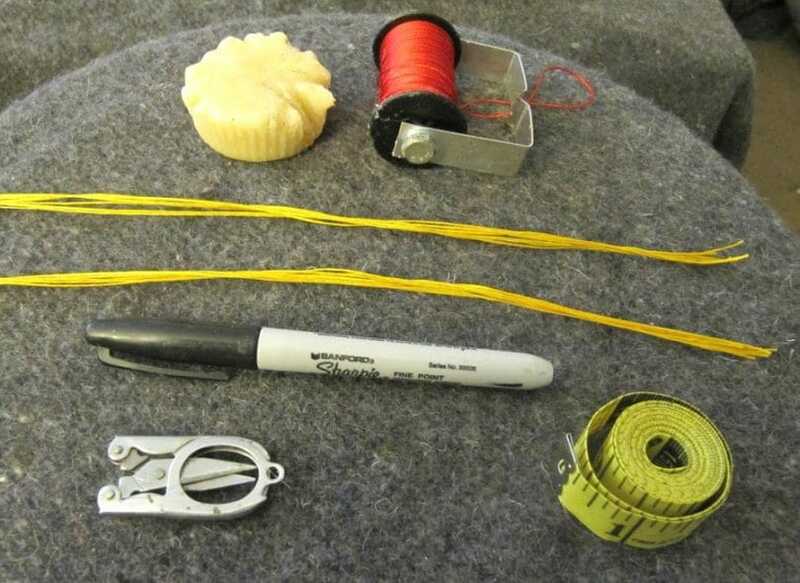 Still, with these easy to follow instructions you’ll learn how to make a bowstring as quickly as possible. Both the Flemish bow string and the continuous loop bow string are commonly used by modern archers. These string types each have their benefits and the debate rages on. Today, you will learn how to make a 2 ply Flemish bow string. We will also provide some tips and tricks to make sure you get the highest quality string that suits your personal archery style. String (2 colors): There is a lot of debate among archers about which is the best string on the market. Traditional archers used linen string made from flax or sinew. Primitive archers today sometimes use artificial sinew. 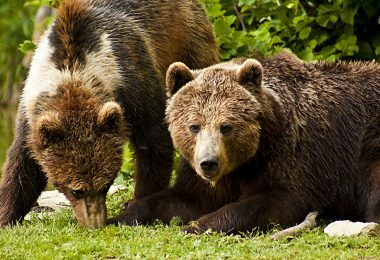 However, there are claims that artificial sinew will stretch too much, especially in wet conditions. For modern archers, a very popular choice these days, if you have a bow built to handle it, is fastflight. But at the end of the day, you can’t go wrong with Dacron B-50. This tutorial has been written for Dacron B-50. String Jig: You will need a special Flemish string jig. You can buy one of these on amazon or at an archery supply store. Adventurous archers can build one at home using a 2×4 and two dozen finishing nails. Make sure the jig is the correct length for your bow. Step 1: Set the strands into the string jig. Lay the jig out in front of you with the parallel row of nails to your right. Tie the end of the string to the top left nail and wrap the string around the jig. 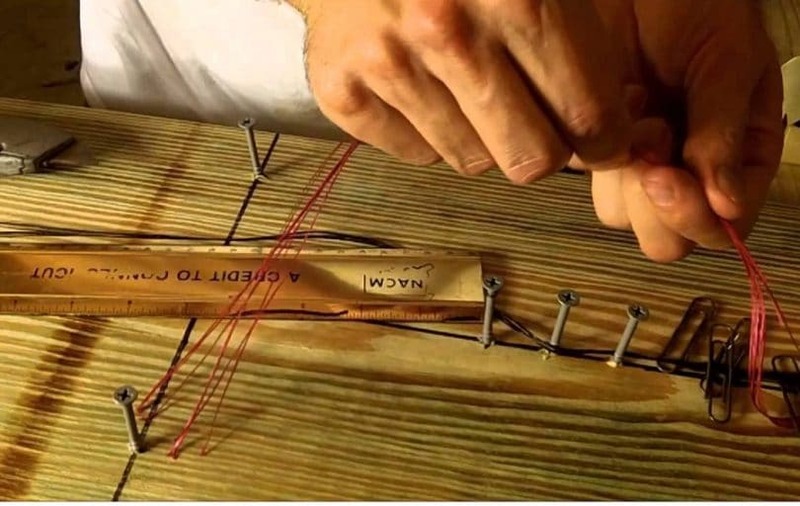 Wind the string around the jig 6 to 8 times, staggering the string down the row of parallel nails, with each wrap around being slightly shorter than the last. When you are finished, the string will form a ladder with 6 to 8 rings. 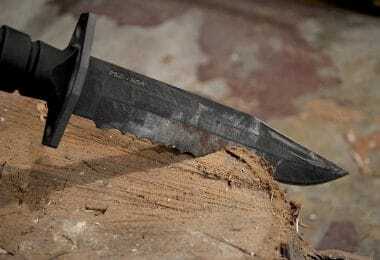 When finished, cut down the middle of the ladder with a sharp knife or razor. Carefully remove the strands from the string jig and set aside. The ends of the bundle of strings should be staggered. Do not adjust this! Repeat this step with the next color string. How many times should I wrap the string? 40-50lbs bow – 6x with each color, for a total of 12 strands. How do I know the strings are the correct length? Ideally, your string jig will be built to suit your bow. Here are a few rules of thumb for string length: for a longbow subtract 3” from the bow length, for a recurve subtract 4”. Then subtract 14” to account for braiding. So for a 60” longbow, you would want your strings to be 71” ((60-3)+14=71). Your string jig should automatically give you a string of this length. This is such a small but important step. If your string is not waxed the Flemish braid will not hold and the string will fall apart as you make it. 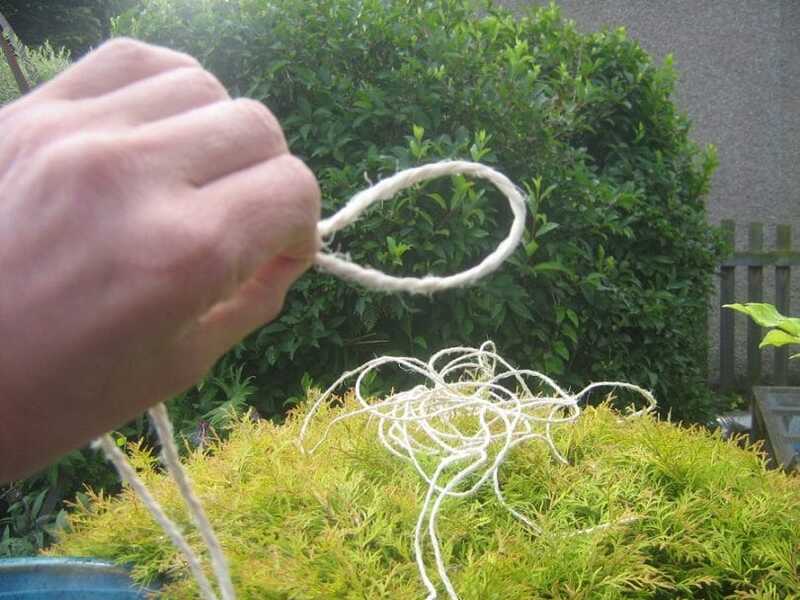 Hold the bundle of string together, keeping the ends staggered as they were when you cut it in step 1. Smooth warm wax onto the string, covering 12 inches from both ends of the string. Don’t worry about the middle right now. Do this to both bundles. Lay the two different colored bundles parallel to each other. Measure about 8 inches back from the ends of the bundle and hold the bundles at that point between your thumb and forefinger, pinching the two bundles together. With your other hand, pinch the end of the top bundle and twist it away from yourself, in a counterclockwise direction, until it is twisted up to the end. Now rotate the bundles by pulling the top bundle towards yourself over the bottom bundle. Repeat this twisting and rotating until the two bundles are braided together completely. At this point, you have braided together one end of your bowstring. Lay the braid out in a loop formation, without crossing the bottom of the loop, in an omega shape. The same color string should be on top at the bottom of the loop. The loop should be big enough to fit over the top end of your bow and slide 5 to 6 inches down the top arm of your bow. Hold the two bundles with your thumb and forefinger right at the bottom of the loop. 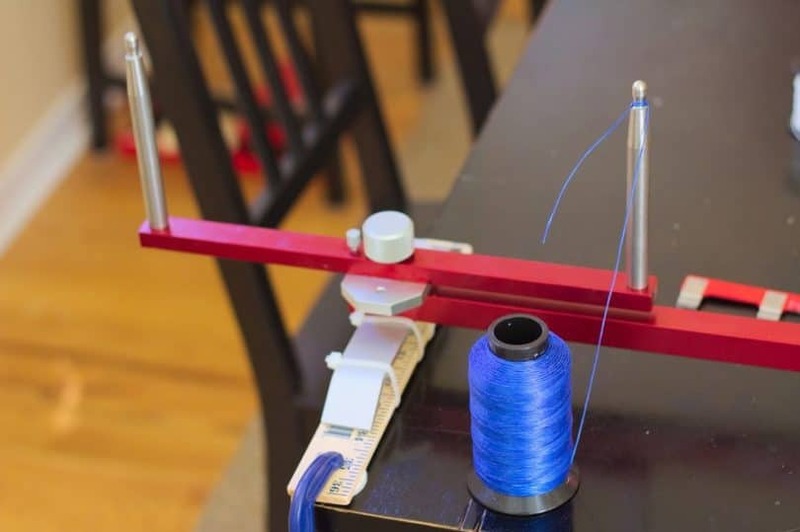 Begin to repeat the twisting and rotating motion from step 3 until the short end of the string is braided into the bowstring, with no loose ends. Put a little tie or clamp on the end of the braid to hold it in place while you create the bottom loop. During all this twisting and rotating, the long lengths of the bowstring may have become tangled. Slowly untangle the bowstrings until they are laying side by side, parallel to each other, extending neatly from the top loop. Pull on both of the strings a little to make sure there is no slack in either bundle. It is essential to keep each bundle the same length, or else your finished bowstring won’t be as strong. Repeat steps 3 and 4 for the bottom loop of the bowstring. Measure 8 inches from the end of the string and begin twisting the top bundle and rotating it over the lower bundle. During the twisting and braiding motions, you may need to stop occasionally and untangle the middle of the bowstring. Run your hand through the strings and pull slightly, to make sure they remain taught. The bottom loop can be smaller than the top loop. Most importantly, the bottom loop needs to fit over the knocks of the bottom arm of the bow. The other option for the bottom loop of your bowstring is to tie a timber hitch. To do this, braid the last 8 or so inches of the bottom strings and put your timber hitch in place. Whether you put a timber hitch or a second Flemish loop is really a matter of taste and what works for you. 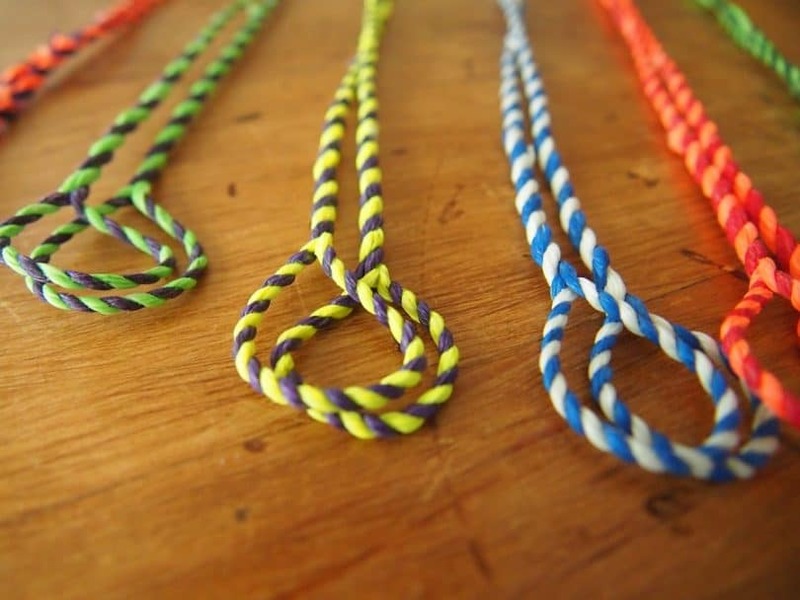 Time to twist up the remaining string bunches in between your two loops. Make sure you twist the string in the same direction as the loops! Twist it in the wrong direction and you’ll end up unraveling your two loops. This is a very important step that you cannot skip or miss. If you try to nock your string right away, the string will stretch out the first few times you use it, resulting in the nock being in the wrong place and the string becoming more or less useless. One solution to this problem is to put a temporary nock on your string while it stretches out, then you can add the permanent one afterward. 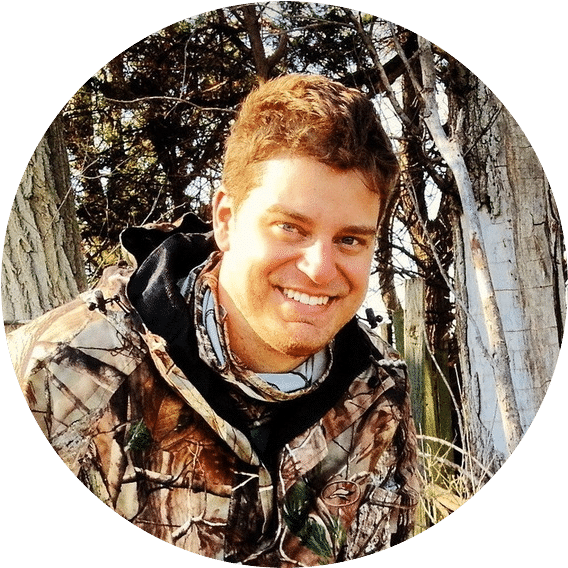 While you have this temporary nock in place, you can take the bow out and shoot a few times, compensating for the slowly stretching strings by twisting and untwisting the string. This twisting will help adjust the brace. Another way to stretch the string is simply to tie weights to each end of the string and let it hang over a rack. This lets gravity do the job, but also means that if you only have one bow, you won’t be able to shoot for a few days. Whatever you choose, be sure to take one to two days to properly stretch out your string before applying the permanent nocking point and stringing your bow. You will need that serving string and serving jig in order to complete this step. First, get your newly made string onto your bow. Top loop is placed over the top, bottom loop onto the nock at the bottom. With the string on the bow, mark the place where you want your nocking point to be, ideally. Then from there, mark again about 2 inches above and 5 inches below. This will be the range for your nocking point. Place your serving string into your jig and let out a few inches of string. Check the tension. You want there to be a decent about of tension so that you get a tight wrap, but if there is too much tension you run the risk of cutting your newly made bow string. Pull apart the bowstring at both ends of the nocking area. Now insert the serving string through this gap at the top of the nocking area, just a few inches of string should be sufficient. Start wrapping up your nocking area with the serving string, but make sure to keep the loose end of the string tucked under the wrap. 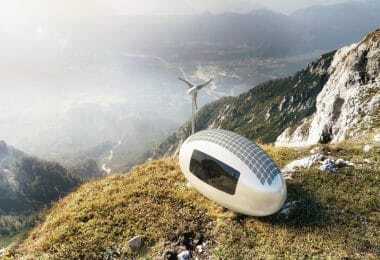 Wrap up your nocking area tightly until there is only ¼” to go. With only ¼” left to wrap, you need to wrap it up nicely so that there are no loose ends. This can seem a bit complicated, but once you figure it out, it’s actually pretty sensible. Read the directions through carefully one time before trying it. With the nocking area waiting to be finished, get your Dacron B-50 that you used to make the bowstring. Cut about 10 or 12 more inches of the B-50 and fold it over itself so that it has a loop on one side. Place this string alongside your bowstring, parallel, with the loop on the end laying towards the end of the bow. Now take up your serving string again and wrap it around this new Dacron B-50 string at least 8 more times. Make sure these new loops are a little loose, not as tight as the rest of your nocking area. Once you’ve wrapped to the end of the nocking area, pull a few more inches off of the serving jig, then cut the string. Take the end of the serving string in your fingers and pull it through the loop in the Dacron B-50. Then push the loose end of the Dacron B-50 string underneath those final wraps of the serving string, the ones you intentionally kept loose. Tighten up all the strings, and you’re finished! You’ve prepared your nocking area. Grab your wax and give your whole string a once over. Now that you’ve got wax on the string, you’re all finished. 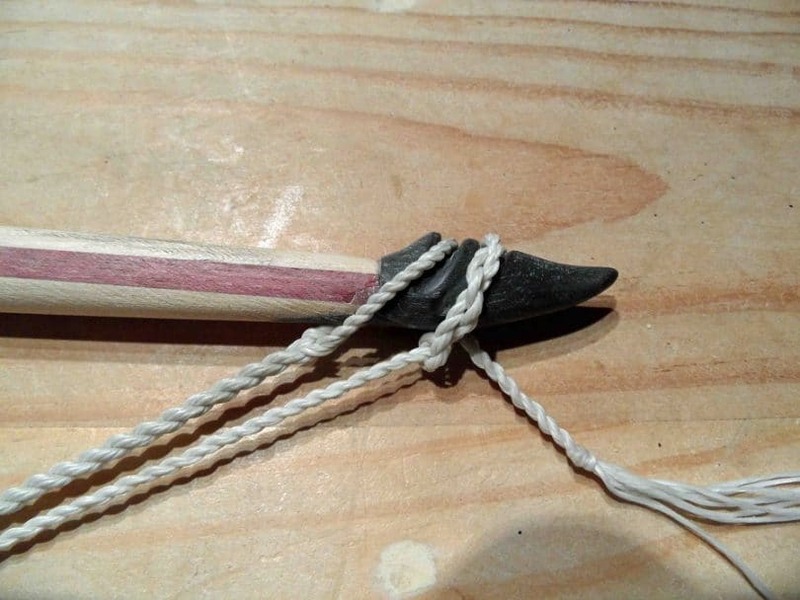 Now you know how to create a bowstring with your own hands. The first few times might be challenging, but keep practicing. Once you get the hang of it, you’ll be able to produce high-quality strings in a really short time. 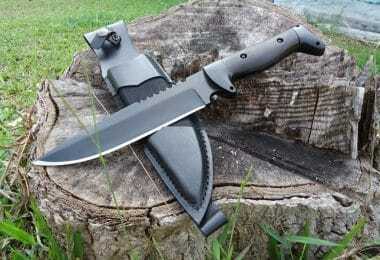 Also check out our piece on how to choose the best hunting bow for your survival needs. Not to mention, you save a lot of money making your own strings. A spool of Dacron B-50 costs just a bit more than a store bought string, but it’ll make several strings in one spool. And of course, there is something satisfying about shooting with a bowstring that you made with your own hands. Check out our useful tips on how to make a hunting bow for reference.